Affordable Art Fair Hampstead 2017 is a show where I am always happy to show my sculpture. I am delighted to be exhibiting again with the Linda Blackstone Gallery with whom I have been associated for many years. 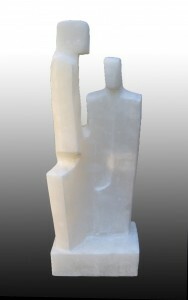 This year I am showing garden sculpture which will be exhibited in a specially designed sculpture area adjacent to the cafe, and a new alabaster carving entitled ‘Inner Beauty’ which is so-called as it displays beautiful markings when positioned in a window or in front of a light. Affordable Art Fair Hampstead 2017 makes an enjoyable day out for everyone. Not only are there art galleries from the UK but also from Europe and the Far East; they show contemporary paintings and sculpture of high quality with a maximum price of £6000. There are also workshops and demonstrations such as drawing and printmaking for all to enjoy, some of which cater for children. Affordable Art Fair Hampstead 2017 runs from 11 – 14 May in East Heath Road, NW3 1TH. Opening times are Thursday 11th May 11 – 9.30, Friday 12th May – Sunday 14th May 11 – 6. And there are courtesy mini-buses to ferry you to and fro from Hampstead Northern Line station.